It is a strange phenomenon: thousands of large, perfectly round "forest rings" dot the boreal landscape of northern Ontario. From the air, these mysterious light-coloured rings of stunted tree growth are clearly visible, but on the ground, you could walk right through them without noticing them. They range in diameter from 30 metres to 2 kilometres, with the average ring measuring about 91 metres across. Over 2,000 of these forest rings have been documented, but scientists estimate the actual number is more than 8,000. What causes these near-perfect circles in the forest? Since they were discovered on aerial photos about 50 years ago, the rings have baffled biologists, geologists and foresters. Some explanations put a UFO or extraterrestrial spin on the phenomenon. Astronomers suggest the rings might be the result of meteor strikes. Prospectors wonder whether the formations signal diamond-bearing kimberlites, a type of igneous rock. "We have been working on the rings since 1998, and there have been many developments, but there are still many unanswered questions," says Stew Hamilton, a Sudbury-based geochemist with the Sedimentary Geoscience Section of the Ontario Geological Survey. Hamilton first became interested in the rings in 1997 when Sudbury prospector and geologist Bob Komarechka asked him about the potential kimberlite link. Now he has some new theories about how the giant rings were created, and his paper discussing some of the strange electrical phenomena that occur over the rings has been accepted for publication in the journal Geophysics. According to Hamilton, the forest rings are caused by giant, naturally occurring electrochemical cells — big centres of negative charges (called reduced chimneys) that are frequently situated over metal or mineral deposits or methane (a natural gas source). Think of them as huge natural electrical batteries with a negative charge in carbonate soil and surrounded by oxygen that carries a positive charge. The current from the batteries — the negative charge — travels outward and where it meets the positive charge, acidic conditions are created that eat away at the carbonate soil, causing it to drop in a circular depression around the natural battery. The origin of Ontario's methane-based forest rings, according to Hamilton's theory, lies in the glaciers and glacial lakes that at one time covered the province. As the glaciers began receding from northern Ontario about 10,000 years ago, they left behind a mix of clay and other glacial sediment. Bacteria began eating the dead plankton and other organic matter left in the clay, a process that can only last a few thousand years before the organic matter is consumed, a short time, geologically speaking. This produced methane, a chemical that is the principal component of natural gas. In the case of forest rings, the methane is released into the atmosphere partly through the depressions of the rings. So why the perfectly formed circles? "Because force goes out in a circle," Hamilton says. "For example, throw a stick in the water. At first it makes a stick shape when it hits the water, then perfect circles go out from that. Electricity is just the same." Gordon Southam, a geo-microbiologist at the University of Western Ontario, has just begun working with Hamilton on the biogeochemical aspects of forest rings. "We debate back and forth on the various theories on forest ring formation. I find it extremely interesting any time that water-rock interactions release materials that support the growth of the biosphere; we're very interested in litho-trophic [rock-eating] bacteria," Southam says. "In the case of forest rings, they appear to create anoxic [oxygen-free] conditions that support methane-producing bacteria below ground and methane-oxidizing bacteria near the earth's surface." A map of forest rings in northeastern Ontario devised by Hamilton also seems to indicate that the creation of these anoxic conditions appears to be coinciding with permafrost melting, which is causing new activity in the biosphere. Why is northern Ontario lord of the rings? Although northern Ontario has the highest concentration of forest rings, you can also find them in the Yukon, Quebec, Russia and Australia. "For years, we have been puzzled as to why Ontario has so many, and we now think we have some of the answers," Hamilton says. "We have measured the isotopic signature of natural gas in a number of rings, and it suggests the gas is very geologically young and is likely still being produced today and constantly escaping into the atmosphere. Northern Ontario has the youngest and most extensive glacial clay deposits in the world, and therefore we also have the most rings." He estimates 80 per cent to 85 per cent of the region's rings are methane-based, with the rest being a result of kimberlite; hydrogen sulfide (recognizable by its "rotten egg” smell); metal-based sources such as nickel, copper and zinc; or buried peat. These, too, are all sources of negative electrical charge and have a capacity to create similar electrical fields as methane. "On the one hand, the rings are a large potential source of relatively clean natural gas. On the other hand, they are constantly venting methane into the atmosphere, which has a greenhouse gas equivalent that is more than 20 times that of carbon dioxide," said Hamilton. He is keen to see companies develop technology to extract the gas and use it as energy. "Extracting the gas would therefore be doubly beneficial and also fairly easy from a technical point of view." And what about those other exotic theories of forest rings? "It is definitely not a UFO thing, crop circles, tree-killing fungus or meteors falling from the sky," Hamilton laughs. He does admit, though, that forest rings have "a million mysteries." For example, the electrical field found inside the forest rings is a puzzle that needs to be solved. "It shouldn't be there," Hamilton says. "Something is creating a huge electrical field, and we think it might be millions of chemical-eating micro-organisms in the soil." Hamilton, University of Ottawa geochemist Kéiko H. Hattori (chair of the department of earth sciences) and graduate student Kerstin Brauneder are the only Canadian scientists currently studying forest rings. This summer, they will test their hypothesis by generating chemicals in test tubes and adding some forest ring micro-organisms (bacteria) to the chemicals. "To see a perfectly round forest ring in the middle of the forest is really very strange," said Brauneder, whose master's thesis is titled Origin and Distribution of Forest Ring-Related Methane. "This summer, Dr. Hamilton and I will be sampling soils over five forest rings near Timmins and Hearst. Together with Dr. Southam, we will try to recreate a small-scale forest ring phenomena in-vitro, in a test tube, to see where and how methane-producing microbial communities grow. Understanding the methane-cycle of the rings is important, because we are hoping the methane could eventually be used as a new energy source for isolated communities." Calling the forest rings the "world's largest petri dish," Hamilton said the testing will be the first step to recreating, in the lab, the mysterious electrical field process. "Our hypothesis is that with the forest rings, millions of micro-organisms are creating a massive, low-voltage electrical field that causes their food, the chemicals, to come forward to them. The bacteria don't have to move — the food keeps coming to them along the electrical field they have created," explained Hamilton. This, he said, also poses an intriguing question: "Are micro-organisms changing and modifying geology?" "It is a new paradigm for us. What science doesn't understand is the most interesting, and we're having a lot of fun working on the many pieces of the strange puzzle. This is beyond science fiction — it is unbelievable." Last edited by nick c on Wed Mar 30, 2011 9:26 am, edited 1 time in total. junglelord wrote: Hamilton first became interested in the rings in 1997 when Sudbury prospector and geologist Bob Komarechka asked him about the potential kimberlite link. Now he has some new theories about how the giant rings were created, and his paper discussing some of the strange electrical phenomena that occur over the rings has been accepted for publication in the journal Geophysics. And here I thought charge separation wasn't supposed to occur in the natural world? But, now we've apparently got Earth Batteries... Cool. They must go along with telluric currents and such, eh? I tend to disagree with the conclusions proposed by the author. If you look at the "forest rings" the evidence for electrical scarring is evident. I haven't checked all 2000 or so rings, but I would bet that they all share common characteristics. 1. Notice that the river flows through "meanders". The arcs are really portions of ring structures that the river has adopted. Three circular structure are visible at the top right -- the river partially flows around their circumferences. 2. If the vegetation were removed, the Lichtenberg trackway with its ancillary small craters would stand out like they do in the deserts of the world. The trees partially obscure the figure, but it is there. 3. In the middle of the picture is a sweeping arc with a crater at its apex very much like the Iturralde Structure in Bolivia. I was kinda wondering something like that! Thats what came to my mind but I am not as positive on electrical scaring as I could or should be. I do not doubt it for a second, just wonder how prevelant it is. Your thoughts did echo my own. Not sure its correct, but yeah thats why I posted it, hoping someone would be braver then I and take the plunge. I was not sure if the papers explanation was valid, but it was a cool concept too. The Electric Universe stamps the blueprint for life on planets duing electric discharges to moons. Forgive the writing style this takes. Riddle me this Batman… Crackpot or prophet? Petulant Student: “So God parted the Red Sea with magnetism or static electricity. OK Mr. Genius… How did God create life using natural laws we can see today? Matter is simply positive and negative ions. The matter began to clump together at the microscopic level because opposite charges attract. The clumps got bigger and bigger. When the clumps reached certain size gravity was born. Gravity made much bigger clumps. Some of these clumps were so large their shear mass and weight ignited them and suns were born. The suns pumped out positive and negatively charged ions and moving charged particles created magnetic fields and these magnetic fields began to revolve as this is how fields naturally interact. The ions pumped out by the suns struck smaller clumps of matter in the star’s vicinity. These smaller clumps became electromagnets as the charged ions flowed threw them and developed magnetic fields of their own. The interacting magnetic fields of the clumps started the clumps revolving. The revolving clumps then themselves revolved around the sun that was pumping out the source of their electrical power. One solar system became two and then there were galaxies and the galaxies magnetic fields revolved. Some of the smaller clumps developed moons which were simply even smaller clumps with smaller magnetic fields and the planet and moon’s magnetic fields interacted. Just like when you drag your feet along a carpet you develop a static charge and when the charge is strong enough it will discharge to the smaller object. Moons drag their magnetic field through the magnetic field of the planet they revolve around and when enough charge is accumulated a discharge occurs. This “planetary lightening” hitting the moon sculpts the moons surface. For example below is a picture of metal that was electrically machined in a lab, and a picture of the moon’s surface. The correlation jumps out at you when you think about it. Petulant Student: OK brainiac if I believe all that guff, it still does not explain the creation of life. At about 2 minutes, six seconds into this demonstration of magnetic fields you will see the blueprints of single cell life being stamped by an intense revolving magnetic field on the ferrofluid. Look at Earth’s moon, how many times has that blueprint for single celled life been stamped on planet Earth? If you watch the demonstration at exactly 2 minutes and 6 seconds into it you will not only see the blueprint for the single celled animal you will see the rudimentary structure of the human brain being stamped. (A split hemisphere, with folds, surrounded by tendtrils). Increase the power of the magentic field and you see the exact folds and patterning that are evident in human brains. Petulant Student: You are starting to scare me. How come we have not seen these flashes of planetary lightening recently? NASA has the cause of the “explosions” all wrong and I will tell you these flashes are the faint beginnings of more planetary lightening in our galactic future. Think millions of years. Petulant Student: Why does this planetary lightening start and stop? Patient Teacher: The charges that the planets and moons carry grow and shrink based on solar output of positive and negative ions. For thousands of years our sun has been declining in its solar output of ions and the Earth’s magnetic field has similarly been decreasing. The solar output of our sun is affected by our sun’s declination to the galactic plane. Our solar system oscillates up and down as it circles the galaxy. We pass upwards and downwards through the galactic plane. Declination to a plane causing change is nothing new; a simple declination in Earth’s axis brings winter and summer. When the charges of the planets drop below a certain point the planetary lightening ceases (the top and bottom of the oscillation). For the entire time man has been around to witness it there has been little planetary lightening unless you count the planetary lightening that brought us the Bible stories which may not be wild stories but the byproduct of planetary convergence (a near, large comet, fly by to Earth). Petulant Student: What is so special about the galactic plane that if affects our sun’s solar performance? Patient Teacher: The answer is three words “revolving magnetic field”. 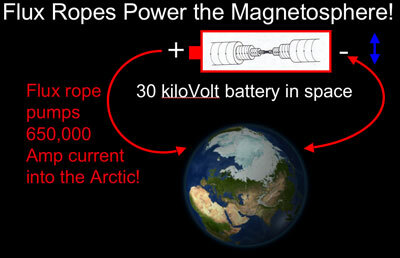 When a magnetic field revolves it changes shape. The nicely arced lines spread out in a horizontal pattern. Just as our solar system lies in a flat magnetic plate the galaxy has a plate like shape. The flat magnetic field plate of the galaxy steers the flowing charged ions to the galactic equator and they flow outwards from there. When our sun passes through the galactic equator it is hit by more ions and its output increases. So as the solar system osciallates up and down through the galactic plate the sun puts out more and less power. There are only three complete oscillations per rotatation of the galaxy. When the power levels cross a certain threshold you will have greater planetary lightening. The onset of global warming and now flashes on the moon are no simple coincidence. They are simply byproducts of our solar systems delcination to the galactic plane. On Earth we call these ionic storms solar storms and can be seen in the northern lights. Think of the galactic plane and its increased energy as a solar storm our sun and solar system passes through. The tiny beginnings of this lightening are now being seen by NASA on the leading and trailing edges of our moon as that is where the electrical fields of the Earth and Moon interact. Petulant Student: Oh my God! I am beginning to understand. Natural laws that are eveident today explain life being stamped on planets and we can expect more stamping. tolenio wrote: Some of these clumps were so large their sheer mass and weight ignited them and suns were born. The question here is whether one believes the internal fusion scenario for stars, and whether a sufficiently large agglomeration of matter will "jump start fusion in the core." Even if one believes that it jump started fusion in the core, that's still in the core. How did it spread outward to ignite the entire mass of the "star?" Wouldn't the rest of the star be either gaseous or solid, if it's in the relatively cold vacuum of space? Just wondering... I could probably see planets being built this way. But, I don't know whether I buy the "somehow a planet turned into a star from the inside out" scenario. 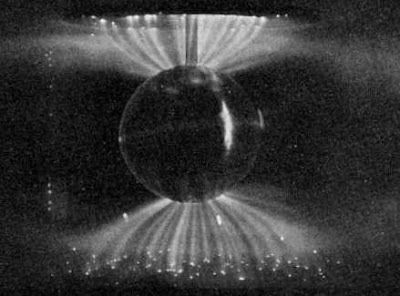 Besides, in the EU / Electric Sun hypothesis, stars are the focuses of currents through the plasma of space, and the ball of light we see may simply be an excited glow mode or arc mode at the surface, as opposed to a nuclear fusion furnace in the center...? tolenio wrote: The interacting magnetic fields of the clumps started the clumps revolving. The revolving clumps then themselves revolved around the sun that was pumping out the source of their electrical power. One solar system became two and then there were galaxies and the galaxies magnetic fields revolved. Overall universal structure appears to be composed of filaments of plasma. EU types would probably say that it is the currents flowing through the intergalactic plasma that causes the filamentary structure. Source of the currents is currently unknown (open question; may or may not be resolved anytime soon) and may be beyond the limits of the visible boundaries of the universe. In other words, things work down ward from the macroscopic to the microscopic. Within galaxies, there is evidence of helical plasma filaments as well (evidence of the scalability of the plasma structures and processes). From stars to planets, the EU model then expects to find more electrical connections, and remains undisappointed... Ignoring the obfuscating language of "magnetic flux ropes" (Birkeland currents / field-aligned currents). tolenio wrote: Electricity produces magnetic fields on both ends of the spark jumping the arc. In the case of planetary lightning the fields would be intense. Magnetic fields steer matter. In intense magnetic fields you can see the blueprints for single celled organisms being stamped out. tolenio wrote: How come we have not seen these flashes of planetary lightning recently? Why does this planetary lightning start and stop? More to the point, as charged bodies interact, exchanging charge, they tend to come into equilibrium, or a state of "least interaction." As such, it appears that the moon has achieved such a state, being as close as it is to us and not transacting with us much if at all electrically. So, there's still a little bit going on yet. But certainly no longer any major discharges between ponderable bodies in our local space. Granted, the "dark" current between the sun and Earth in the aforementioned "magnetic flux ropes" (Birkeland currents). tolenio wrote: What is so special about the galactic plane that if affects our sun’s solar performance? The solar system has an interplanetary magnetic field (IMF), and a heliospheric current sheet. The galaxy also has a magnetic field, I wonder whether this argues strongly for for some kind of (for lack of a better term) galactospheric current sheet (or similar electrical structure giving rise to the magnetic field)? Just a thought, which may be off base. But one figures if there's a magnetic field permeating the galactic plasma it has to come from source current(s) somewhere (according to Alfvén)! tolenio wrote: Crackpot or prophet? It seems that a recently submitted story on NowPublic has just made the front page! I don't know how long the story will stay there. But, good times while it does! As well as several references on electro-culture (electrical horticulture). the electrical field found inside the forest rings is a puzzle that needs to be solved. But, wait, which is it? In one part of the original article they talk about what amounts to a giant electrochemical cell, some kind of Earth-battery but later in the article they refer to the possibility that bacteria are creating the electric fields. Why would bacteria arrange themselves into perfect circles meter or even kilometers wide, rather than patch blobs spread out randomly? Or are they aligned over extant features of some sort? Are they implying the bacteria are the electrochemical cell, or that they're somehow mooching off of it? Or are these wholly unrelated hypotheses? If so, why would they both be mentioned in the article without differentiation? That bit is a little confusing. I neither saw, heard nor spoke any evil... Did you?